This is one of two blankets I made out of the same pattern with the same yarn (bought too much obviously!) It is really nice though and I think my nephew will enjoy it! I have never seen shell stripes before, that blanket is stunning, I love it! 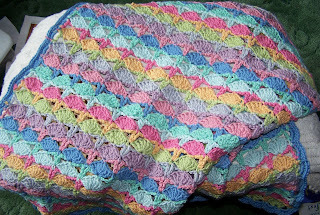 just found your blog and the blanket really caught my eye! It's gorgeous - well done! Did you make up the pattern? Thanks everyone, it is one of my fav patterns. It is out of the Spring/Summer Rowan magazine. It is their choice of colors, which I LOVED! Who could pass up "celery" or "antique". I also saw that the pattern was called "peacock" in Sasha Kagan's new crochet book. OOOHH!! That turned out so CUUUTE!! He will love it and anyone that sees it will love it! !